In this fast-paced and constantly on-the-go world we live in today, high-speed connectivity trumps all other home network needs. The DIR-842, Dual Band AC1200 MU-MIMO Wi-Fi Gigabit Router, is the perfect key to a seamless networking connection for Small Office/Home Office (SOHO) environments. Because of its upgraded 802.11ac wave II specification and Wi-Fi speeds of up to 1200 Mbps, the DIR-842 can not only handle high-speed file transfers, but it also boasts of top-notch range, more channels, less RF interference, and superior bandwidth performance. 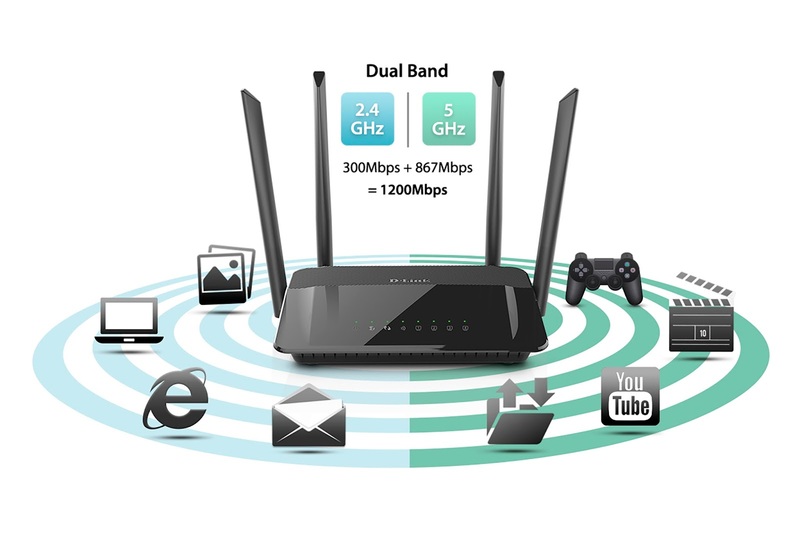 With the data signal rate/speed on both 2.4Ghz (300 Mbps) and 5Ghz (867 Mbps) for Wireless AC1200, you can use the 2.4Ghz for surfing the web, checking your e-mail, and making Internet phone calls—all while using the 5Ghz for Online Gaming, HD streaming, reliable file transfers, and so much more. The DIR-842’s standards of excellence ensure that you can transfer and store those pertinent office files with some well-deserved peace of mind. If your family is into streaming movies, Internet video calls, intense online gaming, and multimedia content, the built-in Quality of Service (QoS) engine offers real-time functionalities that allow you to prioritize important traffic to keep those applications running the way they should. On top of that, the DIR-842 features support for multiple input, multiple output (MU-MIMO) and Gigabit Ethernet ports, so various devices are not a problem. The MU-MIMO can serve multiple wireless clients all at the same time, which provides a faster and more efficient wireless connection for the whole family. With its wide range of management settings, the DIR-842 provides you with greater control over network users by helping you configure a guest zone. This provides your visitors with Internet access without compromising the security of the rest of your network. And if you want to fully take advantage of the Intuitive User Interface, you can download the free D-Link QRS Mobile app so that you can set up your home network right from your smartphone. The beauty of the QRS (Quick Router Setup) Mobile-enabled router is that you simply need to follow the easy instructions to get your router up and running in no time—preferences, security settings, parental controls, and all. It’s time to get rid of lag and stutter when streaming media simultaneously. The DIR-842 AC1200 MU-MIMO Wi-Fi Gigabit Router’s robust features also come with firewall options that provide additional security to your home network. You can implement WPA/WPA2 wireless security, or use Wi-Fi Protected Setup (WPS) so that you won’t have to keep creating new passwords whenever you want to connect multiple devices quickly. Best of all, the Dual-band Wi-Fi-enabled router has an easy-to-use web-based setup wizard, making network sharing a breeze. The DIR-842 AC1200 Wi-Fi Gigabit Router comes at an affordable price of Php3,880 and will be available this August in computer stores nationwide. Upgrade your home and office router now with D-Link and enjoy your best network experience yet.